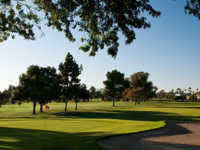 Recreation Park Golf Course, also known as the Big Rec, is an 18-hole golf course with a par of 72. The course opened in 1910, and it was designed by William P. Bell. The course measures 6,405 yards from the back tee, and the course has a rating of 70.3 with a slope of 118. The course has elevation challenges and strategically placed bunkers on the Bent and Poa Greens. There are trees lining the fairways that act as hazards to your game. You usually don't have to wait long for the groups ahead of you, depending on the day that you decide to play. You can book your Long Beach tee times in advance today to receive discounts. Recreation Park Golf Course 18 tee times can be booked up to a week in advance. The course offers cart rentals with GPS so that you can enjoy your stay. There are also practice areas where you can work on your game. You can hit the chipping greens to work on your shots, a driving range to improve your accuracy, or take group or private lessons to learn the basics of the game. The course also has a fully stocked pro shop and a restaurant with a large menu of options. Take advantage of these Long Beach golf deals today.